While the medical examiner's office determined that Gary Gatewood died from a "shotgun blast to the head," it said that, because of the "uncertain circumstances" of the Renton Police Department's investigation, it could not determine if Gatewood was slain, killed himself or died in an accident. Brian Gatewood knew it would be wrenching, walking into the house where his father had died a day or two earlier, but he was unprepared for what he saw: blood sprayed across the ceiling and walls, and blood pooled on the ground. Assured by police in Renton that the death was due to natural causes, Gatewood walked through the house, moved two guns that had belonged to his dad and called a funeral home to take away his father’s body. After a parade of relatives traipsed through the house, he called a company to clean up the gory detritus of his father’s death. That’s when Brian Gatewood found out something was wrong. His father’s 2017 death wasn’t natural at all. In fact, it was anything but: The King County Medical Examiner determined that 58-year-old Gary Gatewood died of a shotgun blast to the head. By the time the Renton Police Department acknowledged their mistake, it was too late — the death scene had been hopelessly compromised, along with any investigation police might conduct. “It was one of the shoddiest death investigations I’ve seen in my career,” said former Seattle police chief Norm Stamper, who was hired as an expert witness in an unsuccessful lawsuit filed by Brian Gatewood against the city of Renton. 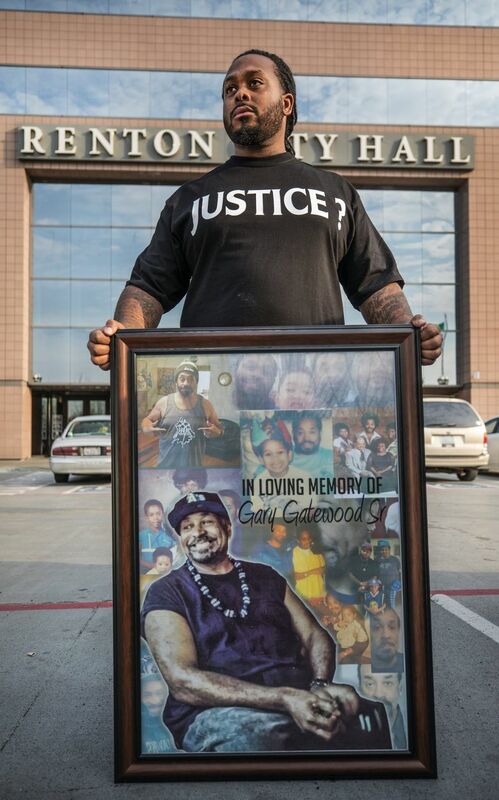 While the medical examiner’s office determined that Gary Gatewood died from a “perforating shotgun blast to the head,” it said that, because of the “uncertain circumstances” of the Renton Police Department’s investigation, it could not determine if Gatewood was slain, killed himself or died in an accident. “I feel certain it would have been done different if he was a middle-aged white man from a rich suburb and not a black man with an alcohol problem,” said Brian Gatewood, 31, of Tacoma. Renton police Investigations Cmdr. Jeff Eddy disputed that claim. “Once we got past what happened originally, we did exactly what we would have done with any other death investigation and we did a very thorough job,” Eddy said. The younger Gatewood was awakened on Feb. 12, 2017, by a cousin, who told him simply that his father was dead. Gary Gatewood, who was born and raised in Seattle’s Central District, had worked for Boeing and at a bakery when he was younger. He had struggled with alcoholism most of his adult life and was living on disability at the end, his son said. His father’s battle with the bottle got worse when he fatally shot a friend, Mark David, 21, who reportedly tried to rob Gatewood in 1990, his son said. According to court documents and his ex-wife, Gary Gatewood was charged with David’s murder but was acquitted when his attorneys proved that he fired in self-defense. The ex-wife, Regina Bembry, who is Brian’s mother, said Gary and the victim had been at Angie’s Tavern in South Seattle when they went outside to smoke marijuana. David ripped a “thick gold chain” off Gatewood’s neck and ran, Bembry said. When Gatewood chased him, David pulled out a knife and Gatewood responded by shooting him dead. “It messed with him; he was seeing it in his dreams and he started drinking heavy,” Gatewood said. Still, Gatewood said his father was mostly a “happy drunk,” loud, jovial and fun-loving. He spoke to all his neighbors, mowed the lawns of older folks, yelled “Hey Champ!” at people and often hugged those he’d just met, his son said. It was shortly after dawn when Brian arrived at his father’s house. From the hallway of the tidy, one-story brick home on Index Court Northeast, the younger Gatewood could see his father’s body on the floor, just inside the door of the back bedroom, lying in a pool of blood. Blood was on the ceiling. As he stepped into the bedroom, Gatewood saw part of his father’s face was missing and that his head was misshapen. Gatewood said he went back outside to ask the cops why there was so much blood. The detectives were defensive, he said, and argued with him. They cited their credentials: Detective Randy Jensen had been a cop for 16 years; Officer Lacey DelValle had EMT training. They told Gatewood, according to court documents in the lawsuit, that they’d both seen similar death scenes involving gastric episodes. When Gatewood asked why his father’s head looked misshapen, the officers told him Gary Gatewood had been dead for some time and that decomposition had begun. They also said there was no need for an autopsy and told him to call the funeral home where his father had made previous arrangements, Gatewood said. A badly shaken Brian Gatewood accepted their explanation numbly and did as advised. The funeral home came and took Gary Gatewood’s body. Relatives came and went. Gatewood said Jensen told him there were two firearms in his father’s closet that ought to be secured. The two long guns, according to Gatewood, were standing up in the back of the closet, behind some clothes, stocks down. Gatewood said he removed them, cleared a spent shell casing from the shotgun and tucked them under some clothes on a bed in another room. Police then gave him the number of Bio Management Northwest, a biohazard cleaning company, and Gatewood called them. By the time the cleaning crew arrived, the two Renton police officers had left. Nicole Norman, who had been with the cleaning company about two years, walked into the bedroom, took one look around and backed out carefully. “This was not a natural death,” she said. When people die, it’s not uncommon for there to be a little blood or bodily fluids present, she explained. “But nothing like this,” she said. What Norman noticed immediately and what the police had apparently overlooked: bone fragments and a piece of skull on a pillow. Her colleague took a look and agreed, she said. Together they took Gatewood back into the room to explain what they were seeing and why he needed to call police back. When Jensen and DelValle returned, they were “irritated,” recalled Norman, and they argued with the cleaning crew, reiterated their expertise and explained what happens during a gastric episode like the one they believed the elder Gatewood had suffered. Eventually, supervisors were called and, according to Norman and Gatewood, the scene was immediately locked down. “As soon as they saw the room, they said, ‘Shut this down. Who’s been in here? What’s been moved?,’ ” Gatewood said. The Washington State Patrol and Renton detective Peter Montemayor investigated. According to the State Patrol’s report, Gary Gatewood’s body was on the floor, near both the door into the room and the closet where Renton police had seen a rifle and a shotgun. There were blood stains, too numerous to count, on “all of the bedroom walls and the bedding” and pieces of “teeth or bone” in the closet. There was also a spent shotgun shell on the ground and a shotgun wad — a piece of plastic that separates the shot pellets from the gunpowder in a shotgun shell — on the floor near the closet. The body had been discovered by Gary Gatewood’s aunt and a neighbor who had called police the night before to request a welfare check, according to police reports. The neighbor hadn’t seen Gatewood for several days and the front door was wide open though the screen was locked, the reports say. Montemayor talked to neighbors, watched surveillance video from the home’s four working cameras and said there was no sign that anybody had entered the home since Feb. 5, which was when the recording stopped. He wrote there was a broken window that hadn’t been noted previously by police and he reviewed the autopsy results. That report described the head wound and said the medical examiner recovered 59 “deformed” shot pellets from the body. He had alcohol, hydromorphone — a narcotic used for pain relief — and morphine in his body. In addition, Jensen and DelValle claimed Gatewood’s relatives told them he had a long history of alcoholism, had cirrhosis of the liver and didn’t take his medicine. “Based on my observations, no signs of foul play and the extensive medical history provided by the family of Mr. Gatewood, this death appears to be of natural causes,” DelValle wrote in her report. Montemayor — a colleague of the DelValle and Jensen — arrived at another conclusion based on his investigation and input from the State Patrol. In an August 2017 email, Montemayor said he had reviewed the State Patrol crime lab’s report and concluded that Gary Gatewood died when he reached for the shotgun at the back of the closet and it accidentally discharged. “This is a non-homicide death and probably accidental — however I have no idea why he was reaching for the gun in the first place,” Montemayor wrote. Brian Gatewood said Montemayor told him that the State Patrol determined that the angle of the wounds indicate that, if it was not an accident, Gatewood would have had to have been leaning over a person who would have been firing at him from the ground. Brian said the detective said he did not believe Gary Gatewood had been ambushed by somebody lying in the closet. In trying to get answers and hold police accountable for what he sees as an injustice, Gatewood filed a lawsuit last year against the city of Renton. His attorney, David Bufalini, hired Stamper — who served as Seattle’s police chief from 1994 to 2000 — as a consultant to evaluate the investigation done by Renton police. He said the investigation of the crime scene was inexcusably bad, and that the follow-up investigation by Montemayor was just as flawed. Stamper said he has trouble with Montemayor’s accident theory because, he said, he has never seen an accidental shooting or a suicide in which the gun did not fall to the ground next to the victim. In this case, the shotgun was found upright in a corner of the closet. “What I’d still like to know, to this day, is how that gun got back into the closet. I guarantee the deceased did not put it in there. Maybe it was a family member not known to police. But everybody involved in that scene said they didn’t touch the guns,” Stamper said. The case was dismissed in July after a King County judge determined Gatewood’s attorney could not overcome the immunity granted to public servants doing their job. Because Brian Gatewood doesn’t really know what happened to his father, he’s haunted by the possibilities. “It’s always in the back of my mind: What happened? What really happened?” he said.